I love meringue. As a child, when my brother and I went with a parent to the baker to buy bread for the weekend, we would often be allowed a treat. Hot sausage rolls were one of our favourites (and I’ve never had one better, even if I can’t really process pork and they made me ill in the long run), but if we went for sweet things, I would nearly always pick a meringue pig, or dog, or sheep, or whatever animal they were doing that day. There’s something so perfect about the crisp outer shell yielding to gummy, soft, insides. Fluffy and crunchy and so, so sweet and light. Mmmm. For a big family party, I volunteered to make a few desserts. One was the lovely fruit salad I shared a week or so ago. 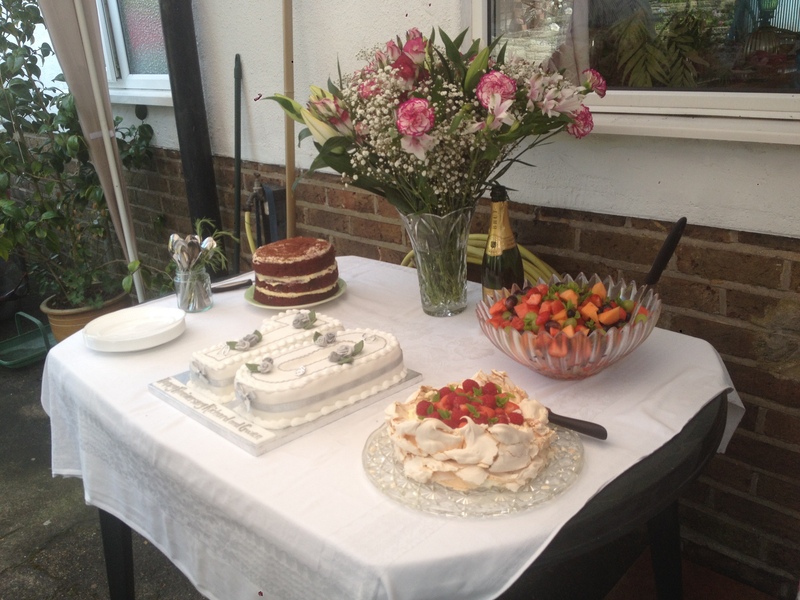 Another was a fabulous three tiered red velvet cake. The third was a sumptuous double layered Red Berry Pavlova. This is originally a Jaime Oliver recipe, and boy did good. I’ve never had much luck making my own meringue in the past, but this time it came out perfectly. The only thing you really need for a pavlova is time. This meringue recipe would work perfectly for individual nests or biscuits too, but here’s how I made my pavlova. Preheat the oven to 150c. Line 2 baking sheets with greaseproof paper, and outline a 20cm/8inch diameter ring on each with pencil. Either in a stand mixer or in a bowl with an electric whisk, beat up the 6 egg whites at a medium pace, until you reach firm peaks. Next, add your salt, then gradually add your sugar about 1/6-1/4 at a time, all while the beaters are going. Once the sugar is incorporated, whack the speed up really high- damn near as high as it’ll go, and beat the meringue for 7 minutes. The transformation will be incredible- the mix will become voluminous, thick, stiff and bright white. After seven minutes test the meringue for graininess. No grains means you’re good to go. If not, beat it for a minute or two more. Spread your meringue into rings on the baking sheets. I like to make a well in the middle with a higher, crown like rim. Use your stencil as a guide for size, and bear in mind the meringue will expand further in the oven. Bake for 1 hour- they should be risen and ivory. Turn off the oven. Moisture is the death of meringue, so my advice is to cool the meringues in the oven, but you could cool them on a rack if you are in a rush. When you are ready to assemble the pavlova, whip the remaining sugar and all the cream to stiff peaks and spread half of it on the bottom meringue ring. Stud the middle layer of cream with half the strawberries and raspberries- any slightly ugly or softer ones can go here. Sit your second ring of meringue on top of the first, top with the rest of the cream and the remaining berries. Decorate with sprigs of fresh mint. Serve immediately, or refrigerate in an airtight container. This dessert is special, yet not particularly difficult, particularly if you use a stand mixer. You just need to be able to tell what stiff peaks are (if in doubt, youtube is full of tutorials) and the rest of the work the mixer and oven do. When I stayed in New Zealand, they had pavlova after nearly every sunday roast or big family meal- they just stuck the meringue in the oven after the main meal was done to cook in the residual heat. The method above does call for actual cooking, and you get a crisper meringue for it, but it’s certainly something you could do in the same manner. It’s a no brainer that you can change the fruit for anything you fancy. Since you eat it fairly fresh, wet fruits like soft berries are too much of a problem. Blackberries, currants, kiwi fruit, even sweet citrus would work well here. Can you imagine a creamsicle flavoured pavlova? Oh my goodness. And the mint here isn’t just a garnish- it tastes awesome with the berries and cream. The soft summer fruit season is coming to a close, so give this delicious dessert a go while you can. 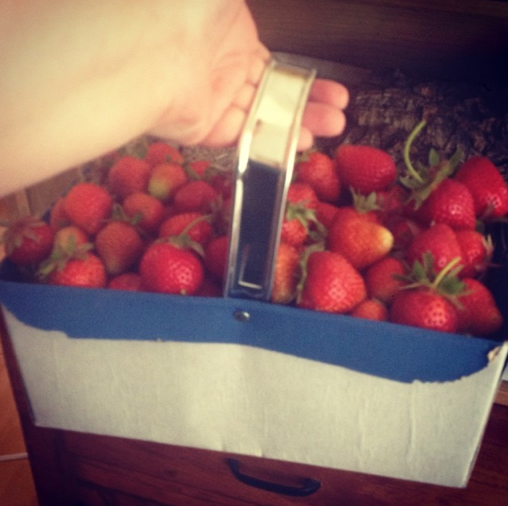 You know I promised Strawberries? This time of the year is strawberry season, and besides growing your own, and generally eating them as often as you can, I highly recommend finding a pick-your-own near you and really benefitting from the season’s glut. I picked these at Durleigh Marsh Farm just on the Hampshire/West Sussex border, and there’s thousands upon millions more more just waiting from greedy fingers to come and claim them across the country RIGHT NOW. If you aren’t in the Hampshire area, or you want a closer PYO experience, follow this link, and you’ll find somewhere to stock up in no time. Really, there’s nothing better than berries fresh from the plant- no chemicals, no lengthy lorry trips, and complete traceability. Posts regarding what I get up to with these beauties shall follow. Stay tuned! 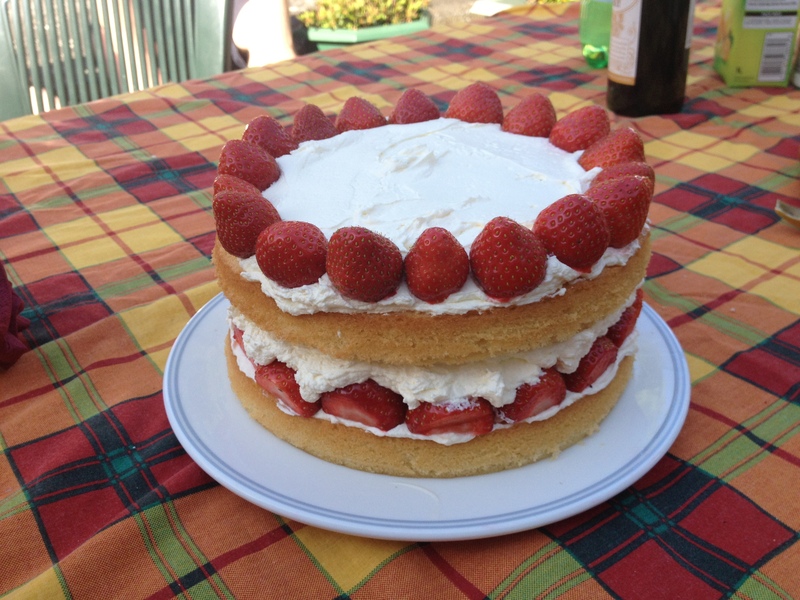 … and Strawberries means Strawberry Gateau. For the sponge, preheat your oven to 180 degrees c and grease two round tins. I personally line mine with greaseproof… if I can be bothered. Usually I just liberally spritz them with fry light. In a mixer, or by hand, cream together the butter and 250g of the sugar until it is pale yellow and fluffy. Next, beat in the eggs until the batter is uniform. Add in your vanilla and give a quick mix through, before folding in your flour. Divide the mixture between the tins and bake for 25-30 minutes. My oven takes about 28 minutes, but my old oven took 23, so I’d check at around 20 odd minutes *particularly* if your oven doesn’t have a viewing window or light. Allow your cakes to cool for at least an hour. I cool mine in their tins because I’m lazy. Once the cakes are cool, hull your strawberries. Reserve 18-22 smaller strawbs, particularly those with nice shapes. Hull these. The others need to be hulled and then cut in half. Whip the cream with the remaining 50g of sugar until it holds in stiffish peaks. Spread a thin layer of this on the cake you are using for the bottom of the Gateau. Line up the cut tops of the half strawberries with the edge of the cake, working your way around before completing rings inside. Fill up the space as best you can- you should be able to fit in 3 or so riings of berries, plus the odd half in any big gaps. Pour 2/3 of the remaining cream on top of the berries and spread it out into a lavishly thick layer. Be sure to not let it extend beyond the edge. To the edge is perfect. Press the hulled strawberries into the cream around the edge of the cake. Finish, if you like, with a dusting of icing sugar. Serve immediately, or refrigerate until serving. This cake is simple enough, yet voluptuous, scrumptious and a real showstopper when you bring it to the table. Serving it in early summer, it is the perfect celebration of the season and a crowd pleaser for all ages. The cream is cool, light, fluffy and sweet, but not too cloying. The sponge should be moist, light and buttery, pleasingly sweet with vanilla. The strawberries are the real star ingredient, however. It is important to use in season fruit for this cake, as their summery sweetness, bursting with juice and goodness is what *makes* this dessert. This cake will easily serve 8-10 as part of a meal, as it did at my Grandparent’s house (as per the pictures. Enjoy. 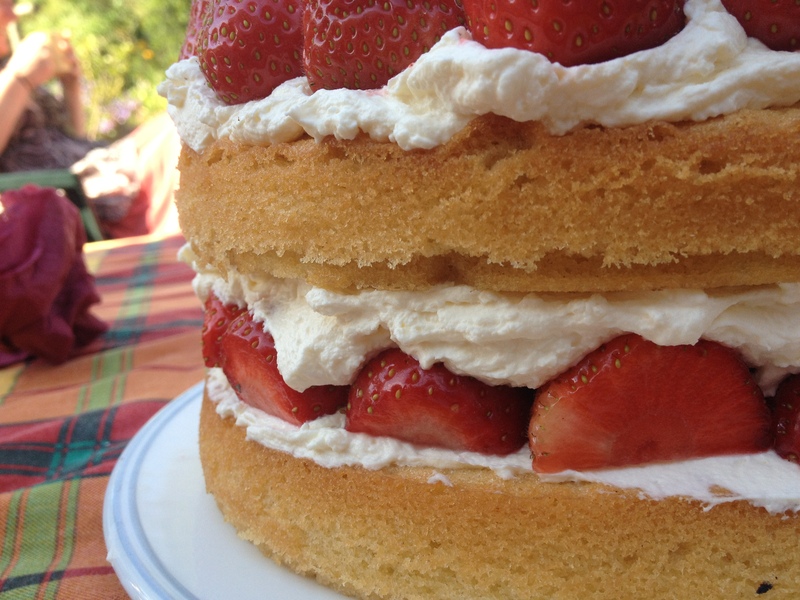 It’s bloody hot out- you deserve this cake.